Veep closed out its terrific fifth season by having Selina Meyer lose her presidential campaign and return to civilian life, a bold shake-up that presented a significant but intriguing challenge for the series moving forward. Then the 2016 election defied expectations and presented the Veep team with a new and much more daunting task: How does one craft political satire when reality is more absurd than many will accept from their fiction? 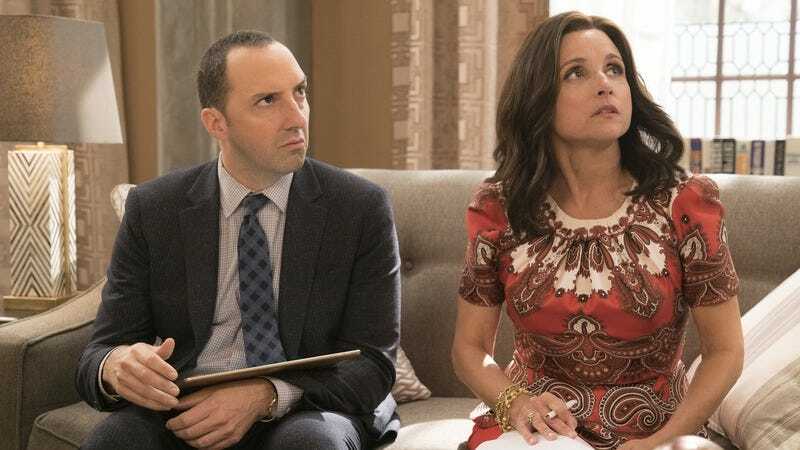 The path showrunner David Mandel and his team have chosen, for now, to focus on the characters and interpersonal dynamics of Veep and leave current political commentary to the side. This may prove to be a prudent choice long-term, but at least initially, the result is a little disappointing. “Omaha” opens a year after the House vote that gave the presidency to Laura Montez. The episode wastes no time showing Selina’s state of mind, Julia Louis-Dreyfus opening her eyes overly wide and forcing a big smile as Dan interviews Selina on CBS This Morning about how the past year has treated her. She has not taken well to forced retirement, and if Louis-Dreyfus’ performance somehow isn’t enough to convey this, the clownlike layers of blush on her cheeks erase any doubts. Selina handles the interview fairly well, projecting warmth and optimism, but her conversations off-air reveal the same narcissism as ever, now paired with a greater need for validation. Selina has not learned from her defeat or come to appreciate those who’ve stood by her: Gary, Catherine, and Marjorie. If anything, she values them less, seeking approval from Richard, now her aide, and reveling in the pandering praise of Andrew. Louis-Dreyfus is once again tremendous as Selina, and she’s particularly strong early in the premiere when Selina interacts with Dan, both on-air and off, and at the end, when Ben pours cold water on Selina’s fantasy of running for the presidency again. It’s not a coincidence that Selina is at her most interesting when she’s maneuvering in conversations with those she’s unable to immediately shut down. That’s not the case for most of the episode, however, and as entertaining as she is, without the contrasts of occasional pangs of conscience or being forced to consider issues larger than herself—shown frequently in season five—Selina is a fairly one-dimensional character. There’s only so much comedy to be found in watching her impotently flail around, complaining about the beautiful offices of her new charity, the Meyer Fund, demanding higher speaking fees, and ordering Gary and Marjorie about. Selina needs people to play off of, not push around, and no one on her current team fits that bill. By the end of the premiere, that team consists of Gary, Richard, Mike, Andrew, and to an extent, Catherine and Marjorie. Gary is still devoted to Selina, but after a year of civilian life, he’s more familiar and notably less subtle in his reactions and asides than Selina would have tolerated as president. The respect Gary demanded from Selina in season four has long since dissipated, and he’s as desperate for attention as she is. Tony Hale goes big for Gary’s reaction to Selina’s pronouncement that she’s planning to run for president again, and the moment works like gangbusters, but it’s his quieter disdain for Andrew and cold greeting to Dan that really shine. Richard’s new role as Selina’s aide is a surprise (why would he leave Jonah? ), and some of the dialogue given to him feels a little off, but Richard’s earnest sweetness and Sam Richardson’s delivery are a delightful counterpoint to the toxicity of Selina and Andrew. Adding to Richard’s positivity is Mike, whose excitement at returning to the workforce (and escaping stay-at-home parenting) is a welcome change from his usual weary approach to his job. Selina has a strong track record of memorable love interests, but bringing back Andrew, as parasitic and slimy as ever, not only makes sense from a character perspective, it also kicks off a subplot that should allow for some pointed political commentary later in the season. Andrew’s crooked dealing will undoubtedly plunge the Meyer Fund into scandal and controversy, and watching Gary chafe against this knowledge, powerless to prevent it due to Selina’s willful ignorance, is a lot of fun. It’s lovely to see Clea DuVall back as Marjorie, and her delivery of “I didn’t know you were going to give me AIDS” is without a doubt the line of the episode. Catherine rounds out Selina’s immediate circle, Sarah Sutherland reminding viewers of just how much she adds to the ensemble as Catherine dissolves into traumatized, ugly sobs upon the news that Selina intends to run for the presidency again. The premiere ends with the rest of the former Meyer team scattered. Foul-mouthed Amy is running her fiancé Buddy’s campaign in Nevada, where she is now the fish out of water in their relationship. Kent is working for Jonah, with Ben soon to follow, and neither is particularly happy to find themselves on the staff of a freshman congressman they loathe. Jonah is faking cancer (or more accurately, hiding having gone into remission) for sympathy votes, a fact Dan discovers with the glee of a boxer puppy about to get taken for a walk. It’s not all roses for Dan, though, who realizes to his chagrin that he’s very suited to his new TV gig, utterly failing in his attempts to sabotage his career. These various threads are a mixed bag. Jonah’s impassioned speech against healthy school lunches to an empty House is great and exactly the kind of political humor missing from much of the rest of the episode. Veep has mostly centered on the executive branch. There’s a lot more comedy the show can mine from the legislative branch through Jonah, should the writers decide to. Similarly, Dan’s new position at CBS opens up opportunities to skewer TV journalism and punditry. Amy, on the other hand, feels stranded in her storyline. We’ve already seen her run a campaign; this is nothing new for her or the show. It doesn’t help that the scene at Buddy’s campaign headquarters is filled with clunky exposition. “Omaha” does a lot of hand-holding, walking the audience through character re-introductions and opting for broad reactions over Veep’s usual, more subtle approach. This may be a blip, the writers welcoming in new viewers with a more accessible premiere before returning to form, or an intentional shift, re-calibrating Selina and her team now that they’re outside the bubble of her presidency. Regardless, there’s still a lot to enjoy in this premiere. There are plenty of memorable lines, a handful of laugh-out-loud moments, and just being able to spend time with this cast and these characters again is a treat. However, Veep’s trademark bite is missing. Selina may be feeling listless, but that doesn’t mean the show should follow suit. Welcome back to The A.V. Club’s Veep coverage! I’m thrilled to be writing about the series once again, and I look forward to following everyone’s reactions and favorite lines in the comments. Speaking of memorable quotes, Marjorie’s two lines about having AIDS, one serious, the second slightly tweaked in delivery as a joke, are indeed my picks for “Omaha,” but I also loved Dan’s goading of Jonah in their interview. I’m very glad to see Margaret Colin and Paul Scheer join the Veep ensemble as Dan’s co-host Jane and producer Stevie, respectively. The insult to injury of Montez winning the Nobel Peace Prize for Selina’s Tibet deal is delicious. While “Omaha” is a lot of fun, the episode clicks into a different gear in Ben and Selina’s scene. The honesty of their conversation highlights the artifice of much of the rest of the episode. These characters are all very performative by nature, but Veep usually pairs them together in ways that encourage them to connect and allow glimpses of their more genuine selves to slip through, such as with Jonah and Richard, Amy and Dan, or even Kent and Sue. That’s missing here.